Apple introduced its iTunes based musical social network Ping on 1st of September and anticipated instant success owing to the 160 million Apple users around the world. Steve Jobs called it “Facebook meets Twitter for music” and explained all the exclusive features it’s offering that other networks don’t. Apple is obviously making an attempt to create a legitimate social network and establish its presence in the social media game but it looks like it’s not as easy as they thought. Call it teething problems but Ping has been hit by Spammers big time and it’s just the third day of its life. 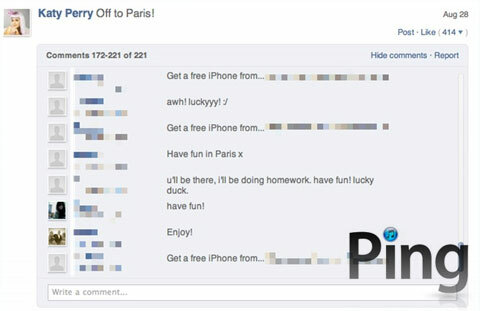 Bloggers and Ping users have started posting their experiences online with reports of massive spam links being posted in comments to users’ posts, most of which offer free iPad, iPhone or iPod touch devices. It is a shock to all that the service implements no spam or URL filtering which shows that Apple did not consider this threat when designing Ping. These messages are showing up in comments to posts from iTunes Featured Artists or in responses to posts from other users who make their content accessible to anyone. Ping does have an approval process for all profile photos used with Ping but the real-time nature of Ping prevents that sort of scrutiny for comments on posts. All it’s offering is a ‘Report’ button next to ‘Like’ which allows users to report content for a number of reasons, including spam, but it doesn’t include the ability to report individual replies to those posts as spam. Ping is also having problems with its Facebook connect feature which was made available at launch but mysteriously disappeared within the first 24 hours. Other problems popping up include their international access issues and some policies for musicians which are still not completely defined and chalked out. Apple will need to act fast to fix the problem and develop a stronger anti-spam algorithm which either rejects any comment with “http://” or “www” or every comment should go through a moderating software. Either way, Ping needs a major overhauling of its system to control the flow of spam currently choking it.